International Journal of Research in Health Sciences,2014,2,3,818-822. 1-Assistant Professor, Pondicherry Institute of Medical Sciences (PIMS), Pondicherry, India. 2-Assistant Professor, JIPMER, Pondicherry. 3-Professor, Meenakshi Medical College, Kanchipuram, Tamilnadu, 4-Associate Professor, Meenakshi Medical College, Department of Microbiology, Kanchipuram, Tamilnadu, INDIA. Introduction: Dengue virus infection is one of the most important human arboviral infection in India. Dengue viral infection outbreaks are frequently reported from various states of India. Activity of all 4 serotypes of dengue virus is constantly reported from different parts of Tamil Nadu. 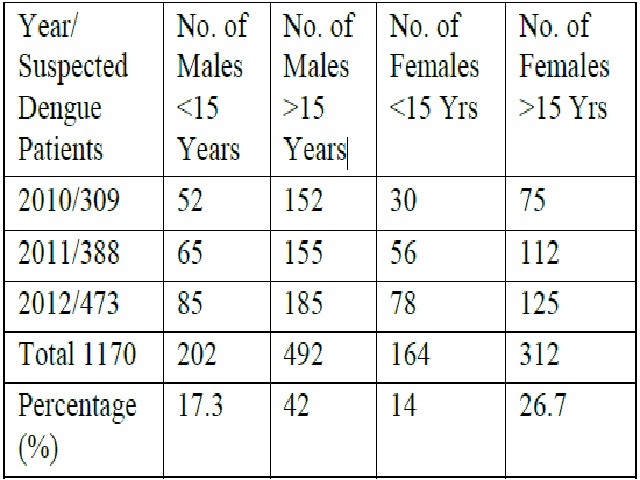 As dengue related mortality and morbidity is more common, this hospital based seroprevalence study was conducted to assess the magnitude of dengue virus infection and to know, whether there is an overall increase in the dengue infection prevalence in Kanchipuram. Materials & Methods: Total of 1,170 (606 males and 564 females) serum samples from suspected dengue fever cases were obtained for three years from January 2010 to December 2012. Samples were tested by a rapid qualitative immunochromatographic assay (Insight / DenV-Ab, Tulip Diagnostics (P) Ltd) for differential detection of dengue specific IgM and IgG antibodies. Results & Analysis: The overall seropositivity was 32.1% [298 (25.5%) were positive out of 1170 for dengue specific IgM and 78 (6.7%) were positive for dengue specific IgG or both IgM and IgG]. There was a gradual increase observed in dengue seropositivity over the study period of three years. Conclusion: This increase in dengue seroprevalence observed, may be an alarming /warning sign of the future epidemics which is again a serious matter of concern.